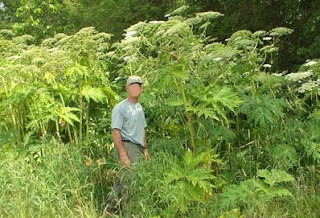 Well here in Ontario we have had reports recently about giant hogweed. I didn't know what it was and didn't care too much. I thought it was like the purple loosetrife that has invaded our wetlands and taken over from local plants. This is similar but a whole lot more dangerous. I have been reading and doing some research on this plant to find out what the big deal is and this is what I have found. I love the outdoors and we like taking the dog for a walk in the woods so I am going to make sure the girls know not to go near or touch it because I would hate to see something happen to them or anyone else. From one parent to another, if you are not sure what it is don't touch it or go near it because you could end up worse than just walking by. I would hate for anyone to have to go through this and especially the blindness it could cause. Stay safe this summer.....your family depends on you. I've never even heard of this plant before, but if each plant releases 50,000 seeds/year, that is a true epidemic. 50,000 squared is 2.5 billion new plants and seeds in the course of two years - and that is just one plant!